There’s nothing that fires me up than when I hear comments made about “fit and healthy” people that are incorrect. I’ve been on both the receiving and giving end of these, but generally find myself on the receiving end. I’ve had these comments said either directly or indirectly to me or friends of mine. I’d like to set the record straight just in case there is any confusion. 🙂 So here I go…out to bust some misconceptions that some people place on fit and healthy people. Misconception #1: We think you’re fat and lazy. Truth: No. Chances are, we aren’t even thinking about your situation and life unless you ask us or it’s directly impacted us. Fit people are worried about “running their own race” and encouraging those when they cross their path. Please, don’t assume this out of a fit person unless they directly say it. Misconception #2: We are obsessed. Truth: Have you seen this phrase floating around the internet? I actually don’t really like the phrase at all. I can see how it would be offensive to some, but part of it is right! We are just dedicated! We know what works for our life and we stick to it. 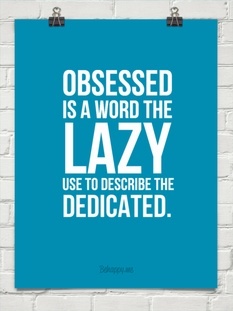 If you are purely going off of being focused on something, then I’d say we are all obsessed about something. Misconception #3: We are vain. Truth: Listen. Just because we enjoy taking care of our bodies, and YES, probably enjoy it when we see some muscle on our shoulders, or our jeans fitting nicely, doesn’t mean we are vain! Are we not to enjoy a visual aspect of life? Do you highlight your hair? Wear trendy clothes? Take pictures of your newly decorated mantle and put it on Facebook? Why? Because there is something to be said for enjoying an aestically pleasing thing! Are there some people who are vain? Sure, but don’t lump us all in that category because we enjoy spending time on our health. Misconception #4: We work out “all the time”. Truth: Is this true for some people? Yes. But I’d venture to say that most of us are hitting maybe 60 minutes a day, 3-5 times a week. Do you know what that equals? Out of 168 hours in a week, we spend 3-5 hours taking care of our health. That’s barely 3% of our week! That’s not a lot of time when you look at it in perspective to everything else we do. Don’t mistake someone who is fit to be someone who is in the gym 24/7. Chances are they have found an EFFICIENT way of working out, are committed, and make MOST of their gains (haha) in the KITCHEN with the food they eat. Misconception #5: We have good genes. Truth: Ha! That’s all I have to say about that. Good genes only take you so far. MOST people’s “good genes” will catch up with them eventually. The message here is both for fit and healthy folks and those who wouldn’t categorize themselves as that. Watch your words. Quit making assumptions of people who aren’t living the life you are. Extend grace. Have a conversation. You never know–you may find yourself in the other person’s shoes one of these days! Are there any other misconception you’d like to BUST about fit and healthy people? Share below! My least favorite thing is when people tell me I’m “lucky” that I’m fit. There is SOME truth to the fact that we all come from a gene pool and some people are “luckier” than others. However, by the time you’re my age (50 years old and a mother of 3), your “luck” ran out with your youth and what you are is the result of choices. I’ve heard that one, too! You are totally right! This is such a great post Clare!! 🙂 Thanks for sharing this. I’ve made these assumptions because of my own insecurities. I felt “uncomfortable” about really fit and active people when I was unhealthy and over weight…. (still working on my weight loss). But once I started working out and eating healthier I realized a lot of these truths first hand. 🙂 <3 Thanks for being an inspiration because of your dedication! That all we eat is rabbit food. Yes we eat healthy, but just like everyone else we eat normal everyday foods. That I need to stop losing weight and I’ve gotten too skinny. I’ve lost eighty pounds in ten months, and actually haven’t lost any weight in the last month, yet the comments continue. Can you imagine if I told someone they were too fat and needed to lose weight? I’m healthy and eat fantastically and LOVE being active!! I have been so surprised that, after losing 35 pounds, suddenly certain women have been making comments to me about their lack of exercise or need for a healthier diet…they word it as though I’m judging them. The outside of me is different, but who I am and how I view others is still the same as always. I value them and their friendships for so many reasons that have nothing to do with their weight…it’s probably the last thing on my mind! Amen! I understand what you mean. The genes! For most of my life, I was skinny and ate junk. I had a high metabolism, and did enjoy aerobics, swimming and walking outdoors. People told me time and again, that as I got older and had kids, my body shape would change. Unfortunately, they were right! Another thing though, is that people assumed because I was skinny, that I was healthy. As I already said, I ate junk. I love junk food and fast food. It seems that “real food” makes me gain weight, but junk food does not. I am positive there are people who have some meat on their bones, but are healthier than I am. I’ve had Doctors say I’m “athletic.” Um, not sure what the definition of that word is, but I would not say I fit it. I may look athletic (minus muscles!) but I am not actually doing anything athletic. Honestly, I don’t even exercise at this season in my life. Lastly, the vain thing. My husband is incredibly muscular. He lifts weights and does indoor rock climbing 3 days/week. He also goes to an insanely challenging conditioning class once a week. He is the furthest from vain I’ve ever seen. I had NO idea how muscular he was (or honestly that he was at all) until we got married and I saw his muscles! He never ever wore clothing that showed off his muscles. He is so far from advertising anything positive about himself. I have had to retrain my mind when comparing myself to other women–just because they are skinnier than me doesn’t mean they are healthy! Our culture has taught us some bad mental habits! Instead I am proud of my extra muscle weight!! I have also been called athletic all my life…?! Whatever does that mean? Ha! Some of us actually just want to live & not die from heart disease or something else equally fixable by keeping fit. This was good to hear as someone who is in the “curvy, not fat, but not thin and trim either” category. I have a couple mutual friends who have really bonded closer over getting fit. I have – in my own insecurities – distanced myself from them because “they must not like me because now I’m too fat for them”. “They really should just stop, they are too skinny now”(because I want them to hang out with me and I desperately wish I was that dedicated too and that I wasn’t the chubby friend). It’s sad because I won’t go to the pool with them during the summer. Which is all just ridiculous. I feel stupid for even thinking that – but it is so easy to let that little devil on my shoulder take hold of any insecurity that I have and to make excuses. But I think we do that to every woman we come across in so many situations from jobs, fashion, number of kids, husband’s involvement or lack there of, car we drive, etc. It’s just a sad state of mind. A terrible place to live in. We all just need to mind our own business, work on being happy and in a state of health – whatever that means to us, and just be supportive to our friends and family. Life is not a competition. What I meant was – I am in the wrong for having the thoughts that I had and I know that. I am only hurting myself by backing away from their friendship because I’m afraid of what they’ll think of my physical appearance around them. As real friends, it wouldn’t matter to them any size that I am. I am slowly learning in adulthood to really and fully focus on Christ and let everything else fall into place. Thanks for the post – it’s a good reminder for everyone! Great post Clare! I definately don’t have great genes; however, I do have genes that predisposition me for things like Heart Disease and Diabetes. Because of my genes, it is my mission day in and day out to end the trend for my family and generations to come. 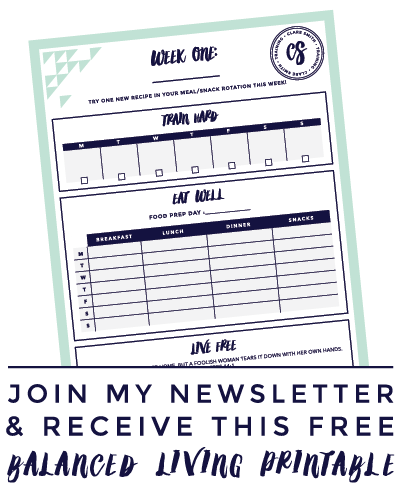 For the most part, our ailments are preventable and if we spend a little extra time in the kitchen – fueling our body – and a little extra time working out – building our body – we can change the future. No need to dwell on those genes anymore – good or bad! Thanks for squashing some myths!! Let’s be Gracious and Love with the beautiful love of Christ! That people can’t just be nice and supportive. This is an excellent article, thank you for sharing these great truths. One misconception could be that we were always this way, that is just came to us “naturally”. I keep getting more and more free when I read posts like these. Most of my life I’ve been crippled by the statement that if I’m focused on losing weight I’m being vain. No, no one ever came right out and said it like that, but as soon as I started looking fit, I would hear comments like, “you were fine the way you were….I don’t know what your obsessing about…I have more to lose than you…I would be happy to be at the weight you had started at…don’t overdo it…it’s whats on the inside that matters…”…and on an on. Maybe others can hear snide comments and ignore them, but every time I got close to my goal weight these comments hurt me the most and destroyed my passion to succeed in what I had been working so hard for. Truth be told, I succumb and say the same things to myself, and worse, at times when I’m starting to see my body look beautiful. I’ve dealt with this since I was a little girl and am now in my forties. This post has come at such a great time because I’m in my third week of healthy eating and daily rigorous 25 minute workouts. This time around I KNOW, for the first time, that I a WILL succeed, and it’s because of one difference…Ithis time I know that GOD has always been the One who was always with me in every previous attempt to reach my goals. This time He’s going to cheer me on as I cross the finish line! He wants me to win just as much as I do. 25 pounds to go and loving it! 30++ years at this – I LOVE THIS!!! I so get it! I enjoy reading stories about athletes. For me one of the most effective motivational tools is to learn the others’ experience. The following resource was also of great help for me – militarygradenutritionals.com/blog/. Among other interesting things, I have also read there about the importance of proper nutrition. I even started taking pre-workout supplement they wrote about. I was pleasantly surprised when I’ve noticed the first results. My strength and endurance went up, making my workouts much more effective. My shape has improved and I’ve even lost weight without any special diet.